Simply the best martingale available anywhere. 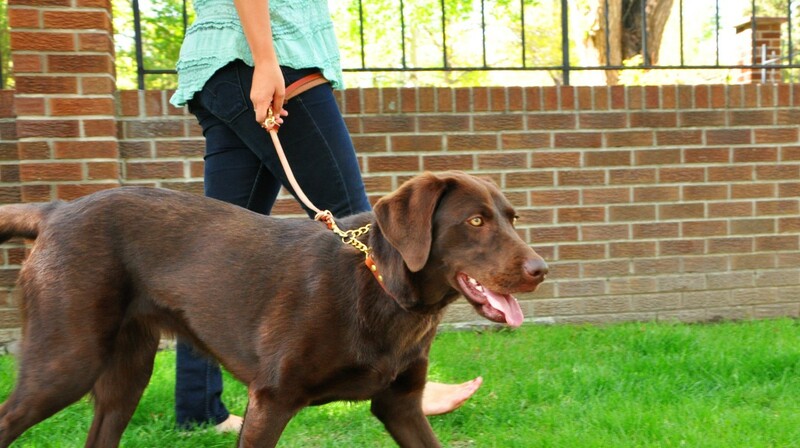 BLD’s unique Martingale collar design is perfect for training or everyday walks. Chain and leather design is adjustable for a perfect fit. Offers a limited-slip/half-check feature. Handcrafted with premium quality solid brass chains or Stainless Steel chains for these beautiful collars. Choose from Clip-On style, or Buckle Style. Guaranteed to last a lifetime. See description for sizing. For dogs over 18 pounds due to our sturdy, quality materials. Not designed as, or recommended for, full-time wear or as an ID tag collar. Original Clip-On style is our favorite! Clips around the dog’s neck, so you don’t have to put it over his head. Elegant and minimal. Buckle style is available if you prefer a regular flat buckle design. Buckle is secure, yet slightly bulkier than the original. Handmade from the same beautiful American leather as all of our products, we have found the highest quality chain assembly and hardware available for a collar that will last a lifetime. Perfect for training or everyday walks— The chain offers a quick correction without tightening too much. 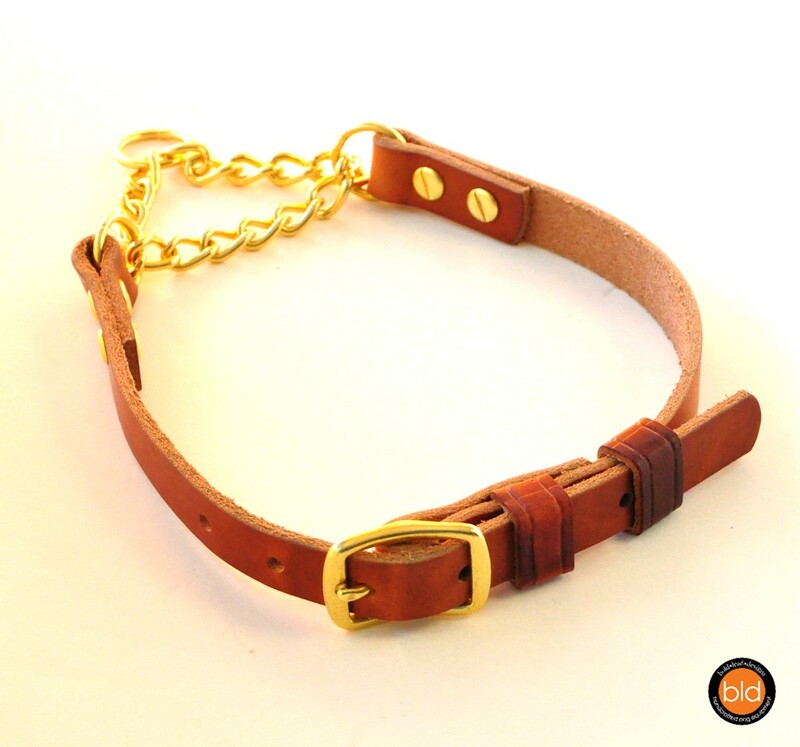 Use this collar as a gentler alternative to a choke, slip, or prong collar. A great tool to transition a dog off of a prong/spike collar. Collar can be adjusted to sit snug and high on the neck for a firm correction, or loose and low on the neck for a gentler option. Many dogs respond well to the sound of the chain links. Great for sighthounds and dogs who can slip out of regular collars. 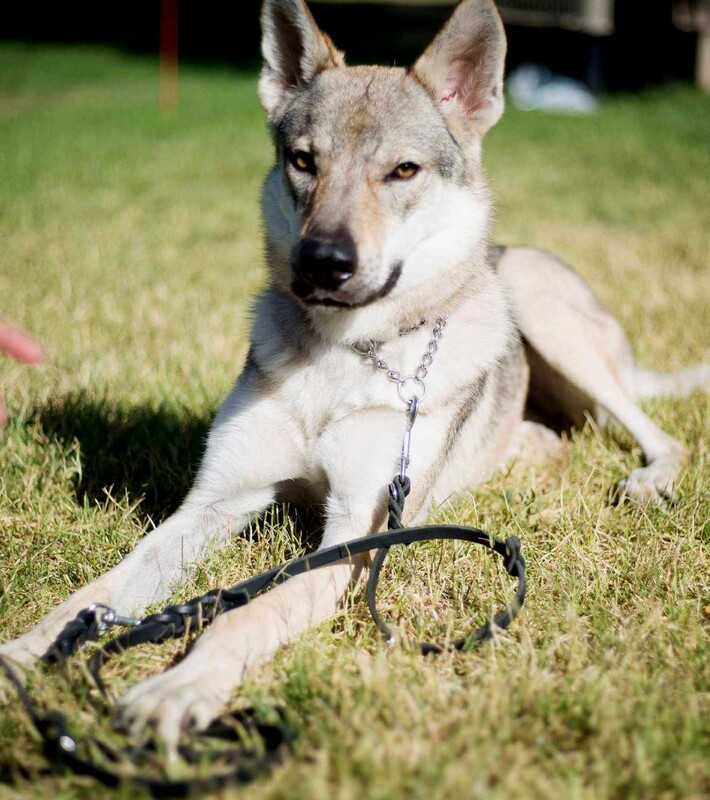 Since the collar tightens a couple of inches when leash pressure is applied, your dog won’t be able to back out of the collar, yet won’t be choked. Sizing: measurements include chain in extended position. Small: 13-16″, 5/8″ wide, (33-40 cm) – lighter weight chain, 3” of slack. For dogs over 18 pounds. Measure snugly around the top of the dog’s neck, close to his head. Collars can be adjusted smaller if needed. Easy to use and adjustable: Adjust the collar to fit your dog as desired with a standard buckle or our special Conway Buckle. There’s plenty of adjustment! Black Latigo leather with Stainless Steel —Back in stock! Thank you, Katrina and Andrew. I have been refunded the cost for the bolt snap and shipping. I appreciate you doing that. I’m disappointed in the customer service from BLD in spite of everyone being very courteous via email or phone. I bought this martingale collar for one of my dogs two years ago. Within a 24-hour period, the clip actually pierced my dog’s neck and created a clean hole directly through the “turkey” skin of his neck. I wrote to Katrina to make her aware that this happened. I received back a reply email saying how sorry she was that it happened and suggesting I try readjusting the hardware or using different hardware. They also added a warning statement to their website stating the collar shouldn’t be left on. So, two years later, feeling more confident about trying the collar again for training, I emailed Katrina requesting to get the suggested hardware. After nine days with no reply, I called BLD. Again, while they’ve been very courteous, they didn’t even offer to send me the $5 bolt snap for free nor offer any kind of discount on the bolt snap or shipping ($3.25). While the quality of most of their products is good, their attempt to guarantee customer satisfaction needs to be improved, especially considering I had been a loyal, returning customer who has spent hundreds of dollars on their products. The incident with this martingale collar could have happened to someone who might try to sue them for the cost of the vet bill or more. I have like most of their products but I can’t recommend this company to anyone. Hello, Thank you for your honest feedback. You are correct that we certainly could have done better, in fact I had intended that snap to be sent at no charge, it was a miscommunication with my team. We’re reaching out personally to resolve it. Absolutely beautiful collars, I have the tan for my red heeler and black for my german shepherd -with matching 8-way leads of course- and they look stunning in them! This was perfect for transitioning my young and boisterous shepherd off a prong collar and she behaves just as nicely! It is very comfortable for them and so easy to get on and off. I love the adjustment buckle design, it sits so nicely and fits in really well with the simple but elegant design. I received this collar after a lengthy search for the best martingale collar for my dog who is able to get out of just about anything once she puts her mind to it. I got the medium for my dog and the fit is perfect. The best part is the clip so you can adjust the collar and then clip it on when you are ready to go out. The leather is just wonderful, soft and good quality does make a difference for training tools/collars and leashes. My dog likes the feel of this collar more than her other collar and I know it’s the leather. I got the black one for my dog and I love it so much that I just ordered the tan as well. 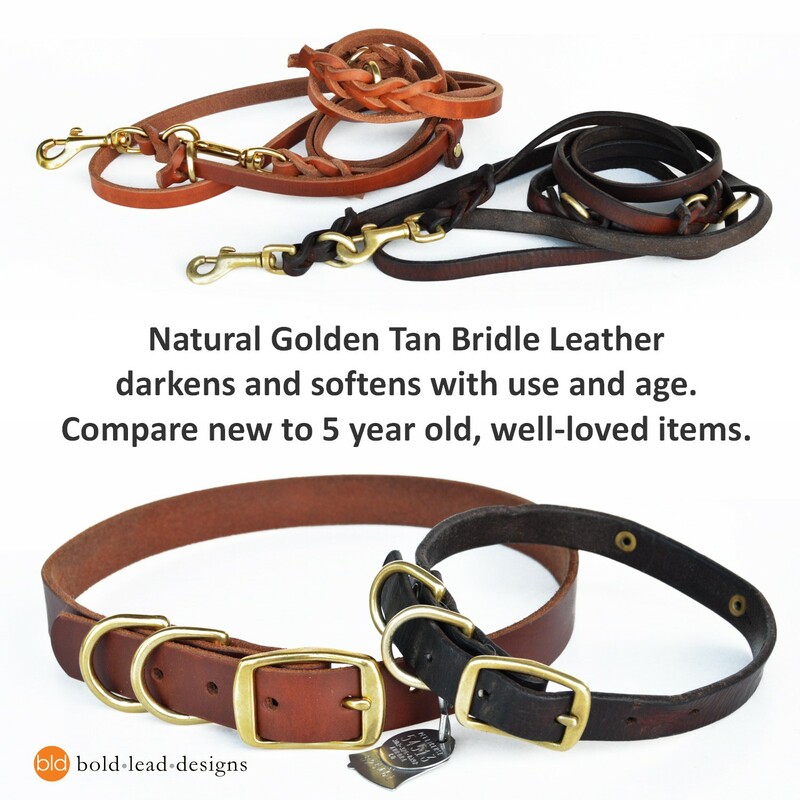 I am an experienced dog owner and take pride in researching products for my pup and the products that Bold Lead designs creates are really far superior to anything else out there. I am a fan and than you so much for making such a great collar for my dog! Bought this collar (in July) in a small for my Labbie pup. I’ve had to steadily increase the size as she’s growing. Soon she will be on the last hole for expansion. Your craftsmanship is flawless. I will soon be in touch for the next size up because I absolutely love this martingale. She will always wear this style. It has a very “high end” quality about it. I’ve received many compliments. Thanks you for a superior product. Great collar. Not too thick, not too thin, just right. The perfect fit is a bit of a hassle to adjust, but once you have it ‘set’ it’s a great collar and really that’s not a complaint, just an observation. I’ve used Katrina’s leads for years and finally bought two of these martingale collars and absolutely love them. I especially love the snap so that you don’t have to slide it over the dog’s head. Beautiful craftsmanship. ?? 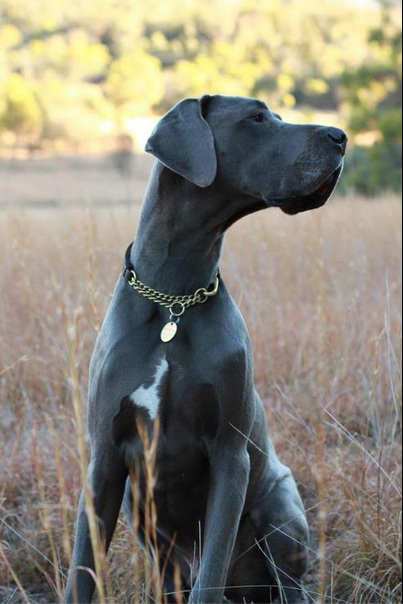 Just wanted to say, that I totally love the martingale collar I bought for my great dane from you guys. Beautiful design and quality. We have used a rolled leather choker collar (1/2 ” for training and every day walking and it ripped where it was stitched, despite coming from a store that caters to giant and large breeds) Our new collar from you guys makes me feel like it gives me control when I need it and have the faith that it will hold up to some occasional pulling. I really wanted to tell you that I am super happy with your product. My black lab, who is my service dog, seems to enjoy this collar. Obviously better than the pinch collar he was trained with. It blends very well with his beautiful black fur. The leather quality is terrific. I’m certainly quite satisfied!! Purchased the black Martingale Collar – adjustable leather and chain with clip and it disappears against the black hair of my 112.4 lb Rottweiler Service Dog. He completed his training without any kind of correction collar and the Martingale made by bld being there reinforces his concentrating on work alone. This collar is far superior to anything that is available locally or anyone else I have found. Working with Joshua and Katrina has been a pleasure. 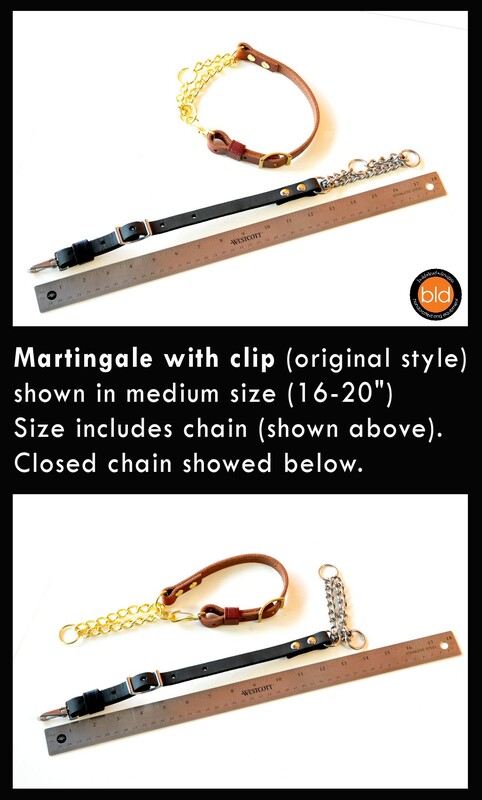 If you want the best I have ever found with hand crafted by true artisans here in the USA then BLD is your answer. Honesty and integrity of the highest order. Our dog trainer recommended a martingale collar. After checking several shops locally we could only find the style that slips on. Such a pain! I searched on line –found this collar & it is perfect. Not only is it easy to use because of the clip but it really is a beautiful collar. Our little English Cream retriever is now 90 lbs and it still fits! An absolute gem in a sea of junk, you will not find a martingale anywhere else that comes close to the quality of this collar. The snap option alone is worth the price, add in the high quality leather and adjustable sizing, this collar is one of the nicest collars I’ve purchased in a lot of years. Huge bonus points to awesome customer service when I needed to request a custom size for my gal. I’m a total craftsmanship addict, this is my new go-to place for training equipment. Thanks BLD! So impressed with this martingale collar. I love the fact that it is adjustable & has the side release clip making it so easy to put on & remove. These collars are soft yet sturdy and so well made. I was concerned that they may rub & remove the hair where the collar sat but this hasn’t been the case. I would highly recommend this collar to anyone. Thanks so much for making beautiful quality items. I bought my dog this martingale collar in the tan and brass for Christmas last year. It is of the highest quality and I love that the hardware is solid brass. It polishes up beautifully when I clean it with a bit of metal polish. It looks stunning on my black giant schnauzer and I’ve received countless complements! 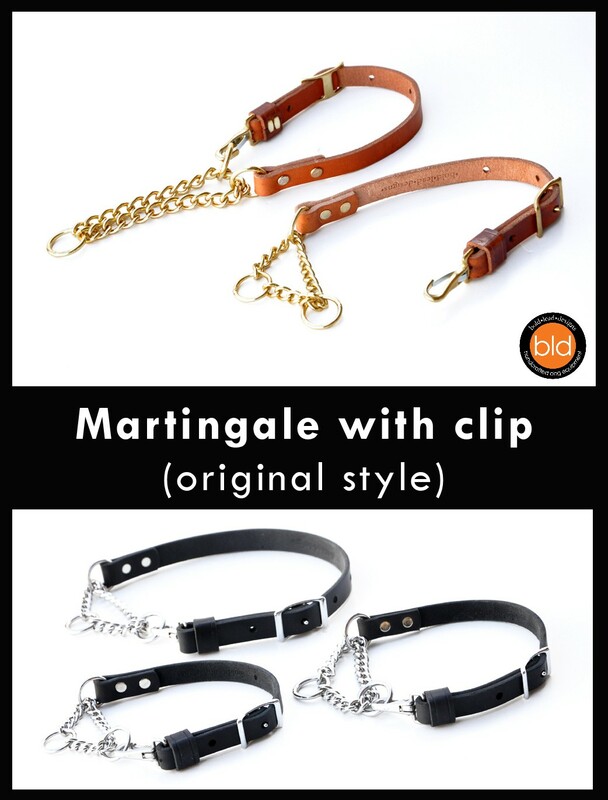 I am very impressed with my martingale collars with adjustable leather and chain with clip from BLD. 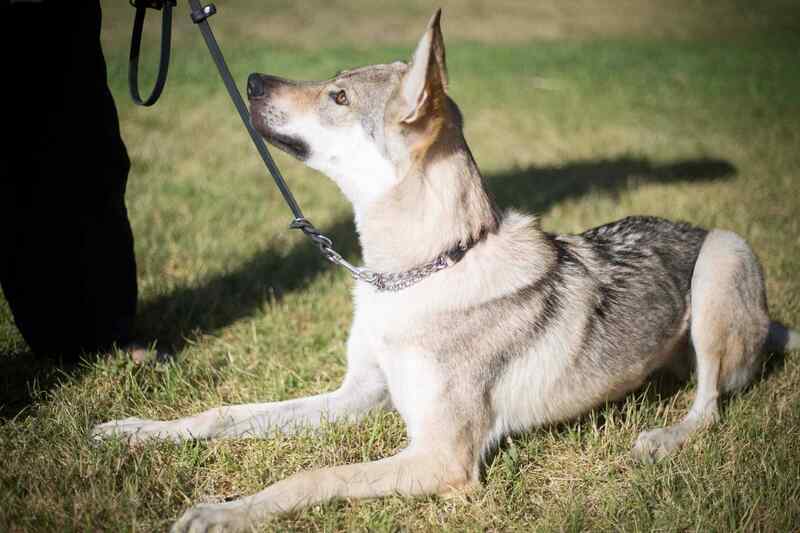 I have purchased two of these for my dogs and they not only are unique in their design, making them easy to adjust and take on and off of my dogs, but they are very functionable and effective as martingale collars. The soft but sturdy leather has held up nicely and the hardware has maintained its shine, yet both are easy to clean and polish as needed. I use mine for my service dog and for training my German Shepherd, both with excellent results. I would recommend one of these to anyone looking for an easy to use martingale collar that will last for years to come, be it for pets, service dogs or any type of working dogs. I don’t think I could ever go back to any other type of martingale collar! Thanks BLD! 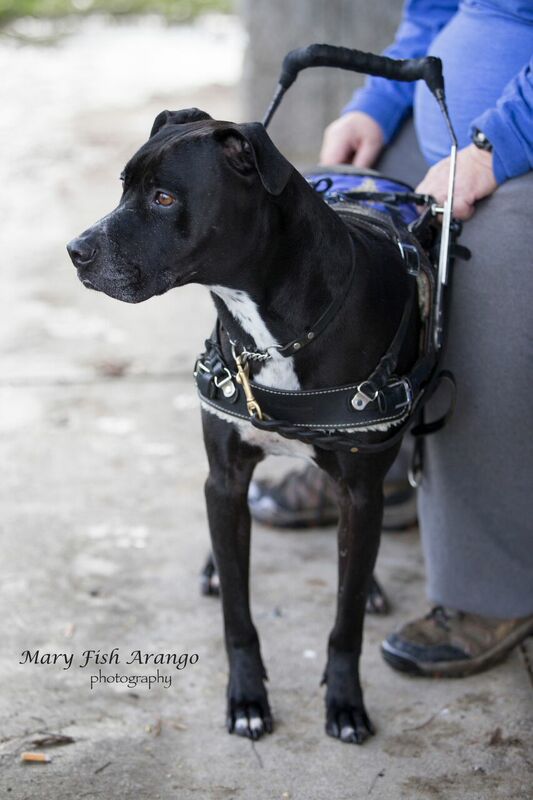 As an Animal Control Officer I have a lot of contact with dogs and their people. I ALWAYS recommend the use of martingale collars over traditional collars especially with newly adopted dogs, scared/nervous dog or dogs with skinny heads (Greyhounds, Whippets, Italian Greys etc). Dogs cannot slip out of this collar! I use this collar on my own pets! My Labrador has chewed several nylon martingales off of my Great Dane but hasn’t been able to damage this one!! We bought this collar for one of our 4 dogs, and it has turned into our go-to collar for walks and hikes! We’ve had it for over a year and the leather is still beautiful, and the hardware spotless. 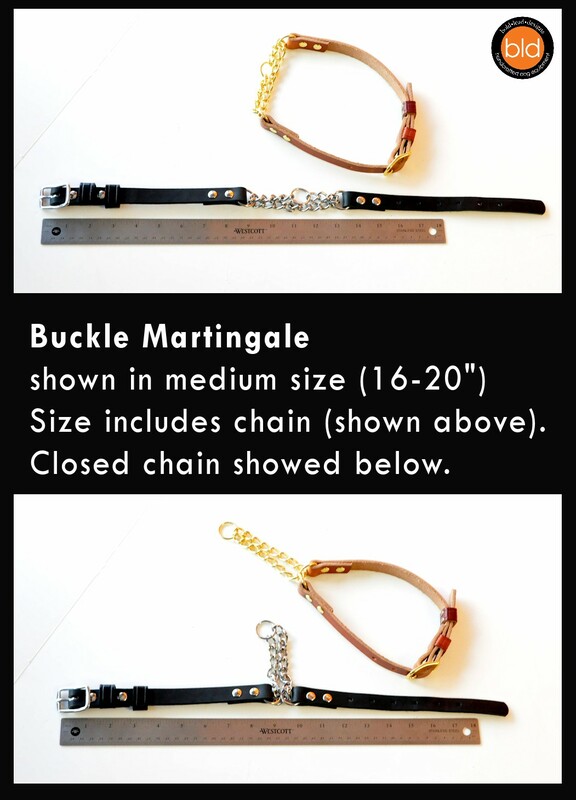 Great, adjustable martingale! I highly recommend it! This collar is so chic. Great design for dogs that are good at slipping collars or are still learning to walk politely on leash. Yes, the black leather will stain light colored dogs but the staining washes off easily and doesn’t happen as much after a few months. It also has a really clever design for adjusting size that gives you a lot of flexibility. Very happy with this product. I love my martingale collars. First of all, they are really easy to get on and off using the clip. I use my in my obedience and rally trials. LOVE LOVE LOVE this collar for when my dog is working or even when he’s out hiking. Katrina allowed us to change hardware and have a tan and silver collar. Even in salt water, no rusting! I love the adjustment buckle – set it and forget it! The easy on and off clip means we can take it off at home super easy and pop it right back on to go out, without going over his head. Strong, supple and made to last forever. This martingale is so nice! The quality is excellent and the clip for easy-on makes it a dream. Thank you Bold Lead Designs! I recently purchased this martingale and was blown away by the quality of the collar. The leather was supple and the hardware was of great quality. Beautiful workmanship! Will definitely be ordering more from you. Keep up the amazing work. I have tried many collars, haters, and harnesses with limited success (and multiple failures). After finding BLD and receiving superb and timely answers to my questions I ordered these collars. Excellent workmanship and design! The hook closure is perfect for long coated breeds. There is no tugging ears or pulling coats to get them off or on AND no broken coat leaving a ring around the dogs necks. I am so happy with this martingale! It looks great and is so easy to adjust and take off. It saves me from having to buy one every two months with how fast my puppy is growing. I think it is so well made! It was shipped so fast I think the service is wonderful I plan on getting my mobility harness from them when he is full grown. This is the best purchase I’ve ever made for a training tool. 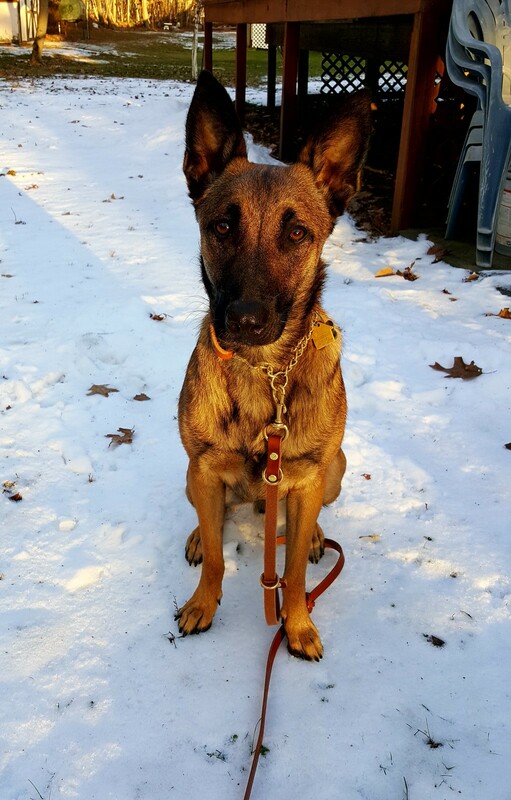 I was having a hard time finding a quality martingale that would work well on my dog. It’s stylish, sleek and most importantly very strong and is quality work. I couldn’t be any happier with it. Lovely quality martingale collar. 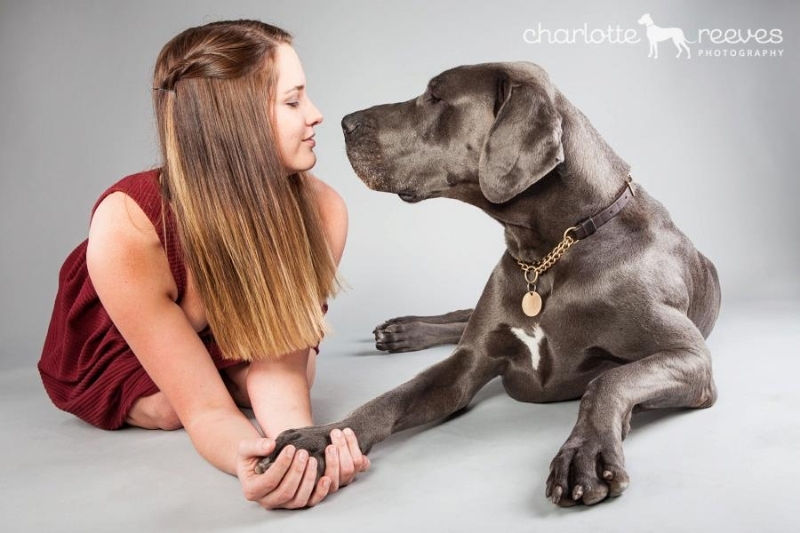 Gives you the ability to provide feedback to your dog without choking them. I ordered the large for my German Shepherd. He is only 8 months so I waivered between the med and large. Glad I got the large because it fits him perfect right now adjusted down to the smallest setting and I can expand it as he grows. great product,look forward to more product as my dane grows. Katrina, thank you so much for expediting my order last week for the Martingale collar for my rescue Oscar! 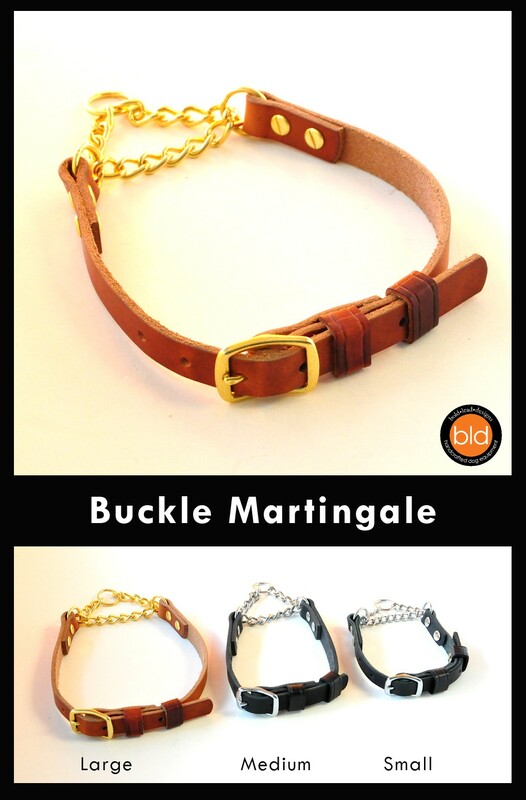 Prior to ordering from you I spent a few hours researching Martingale collars and your design is not only functional, but also elegant and incomparable. Great collar! Having tried several webbing type martingales,that were slip on,so they needed to be big enough to fit over my dogs head but then were difficult to adjust once on. These collars with their clip on design are great,basically set it and forget it!! The combination of leather and chain is stylish and functional.While two of my dogs aren’t really pullers my lab is he responds wonderfully to just a slight correction with this collar!! 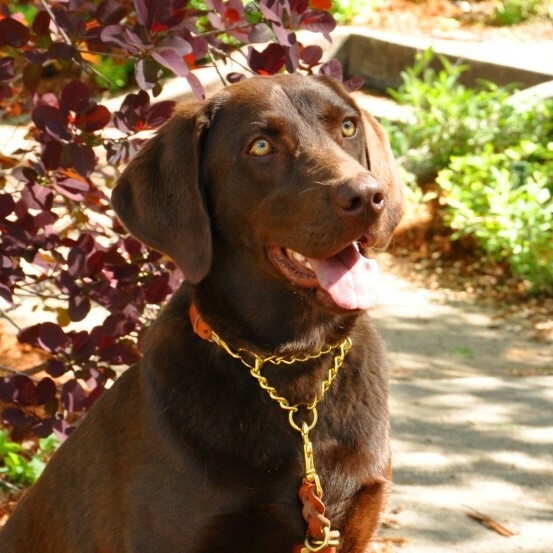 Katrina, I love the new martingale collar and the service dog lead I purchased from you. They make is so much easier for me to walk my 95 lb English Lab. Your work is amazing. You take so much pride in your work and it absolutely shows. I thank you and Sienna thanks you as well. I adore this collar. It’s exactly what I was looking for when I wanted to get my Shelties a more elegant, grown-up collar. The leather is excellent, I love it in combination with the chain, and the clip on the side is a great idea. I highly recommend it! This collar is absolutely fantastic. I highly recommend it to anyone and everyone. As always, my Great Dane is no match for BLD’s guarantee for strength and durability. So many people have commented on his collar, we just love it!